Oops - we don't appear to have a video for the ScanJet Enterprise Flow 7500. Get fast,reliable scanning - up to 50 ppm/100 ipm with 200 dpi in black-and-white,grayscale and color. Scan up to 100 pages at a time,and choose from a variety paper types,thicknesses and sizes - up to 86 cm (34 inches) long. Scan books,ledgers,notes,cards and more using the flatbed scanner. Customize scanning profiles and easily access them,using the four-line LCD display. Seamlessly integrate this scanner into existing workflows using full-featured drivers. Optimize scans with built-in OCR capabilities,and then save in a variety of file formats. Select from several scan-to destinations. Add metadata for easy search,archiving and sharing. 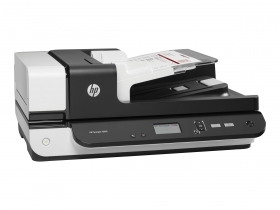 Scan with confidence - HP EveryPage technology keeps scan projects running smoothly. Count on dependable all-day operation with a robust scanner built to handle up to 3,000 scanned pages a day. Easily monitor the system specs and status of your scanner using HP web Jetadmin.